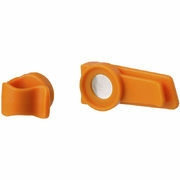 Use this little magnetic clip to replace the hose clamp on the shoulder strap of your hydration system. It allows you to grab the bite valve off the strap and put it back without having to fiddle with it. Designed to fit all Source hydration reservoirs.